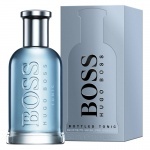 Boss Bottled Tonic gives the inimitable Boss spirit a fresh, masculine twist. Boss Bottled Tonic is a fresh and zesty daytime edition with spices and woods for extra masculinity and modernity. 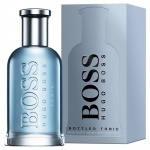 Sophisticated citrus essences and bold wood notes combine to create a refreshing composition that simultaneously endows the characteristic men's fragrance with greater lightness and strength. Boss Bottled Tonic combines grapefruit, bitter orange, lemon and apple, with a spicy heart of ginger and cinnamon. The signature woody base of the fragrance line features a vetiver accord, described as dry, earthy and elegant. Boss Bottled Tonic, gives the inimitable Boss spirit a fresh, masculine twist.Boss Bottled Tonic is a fresh and zesty daytime edition with spices and woods for extra masculinity and modernity.